As the final text of the Paris deal was being wrestled into shape, we were standing near the Arc de Triomphe, underneath a huge red line. 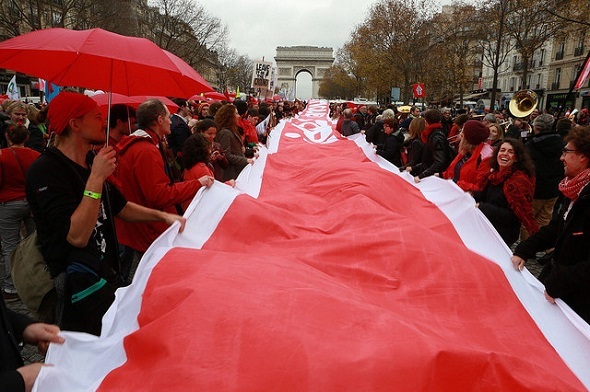 This stretch of scarlet fabric was one of many held aloft by chanting and singing members of a 15,000-strong crowd. They – we – were there to demand climate justice; to condemn an international deal that we already knew would cross crucial red lines for the climate. At the front of the #redlines demonstration, representatives from Indigenous and frontline communities gave powerful speeches, explaining how the Paris deal contained nothing to prevent the pollution and destruction of their lands and cultures. At the same time, mainstream media outlets – and supposedly ‘progressive’ NGOs like Avaaz – were preparing to announce a ‘historic deal’ that would signal the end of the fossil fuel age and catapult us into a bright, clean energy future. In reality, the details of the Paris deal are dreadful. The contrast between the analysis from people on the frontlines of climate change, and the triumphant rhetoric of governments and many NGOs, could not be more stark. Indigenous peoples at the talks condemned it as a package of ‘false solutions’. The peasant farmers’ movement La Via Campesina called it a ‘masquerade’. Friends of the Earth International called it a ‘sham’. Our email inboxes are full of quotes from frontline representatives horrified at a deal that – if followed to the letter – would mean at least a 2.7 degree temperature rise and the utter devastation of their communities. We understand why so many people want to celebrate this deal. There’s precious little good news on the climate change front. There is a risk that too much negativity will make people switch off and succumb to the same cold wind of despair that swept across climate change campaigns in the North after the collapse of Copenhagen. But the thing is, we’re not feeling negative. Despite the dire details of the deal, we’re feeling uplifted and hopeful from our time in Paris. That positivity comes not from the negotiation chambers, but from the incredible activities out on the streets of Paris and around the world over these last two weeks. Of course there are elements of the deal that climate justice activists can use. The fact that governments have theoretically signed up to a 1.5 C degree warming limit does provide, in the words of ActionAid, ‘an important hook on which people can hang their demands’. The vague promise of ‘balancing’ carbon emissions by the second half of the century gives added weight to arguments that the fossil fuel industry is ultimately doomed. Our movements should, and must, use these statements as tools in our struggles. But to openly celebrate this deal would be a kick in the teeth to the hundreds of millions of people for whom its wording spells out the end of their homes and livelihoods. To praise governments for achieving this agreement would implicitly endorse the bullying and misinformation tactics that were used to create it. From the myth of the ‘high-ambition hundred’ who were really only 15, to the demonising of developing countries for attempting to defend their development rights, to the shameful last-minute attempts by the US to bust the whole deal and go home; by calling Paris a ‘success’ we imply that these methods were acceptable. 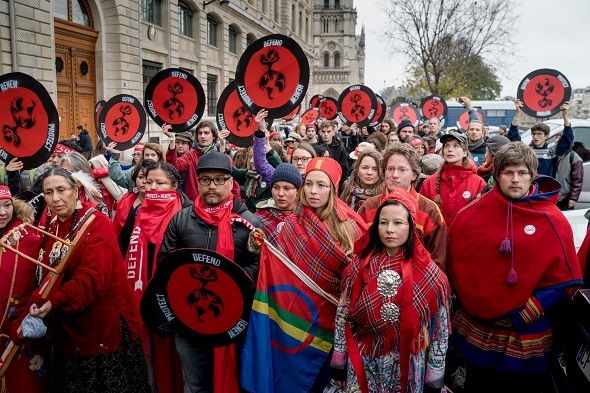 The climate justice movement has learned and grown since Copenhagen. Activists went into these talks with their eyes open, knowing in advance that our politicians (and the corporations who massively influence them) would not deliver an adequate deal. Rather than focus their hopes and energies on the summit itself, people have used it as an opportunity to organize, to mobilize, to build new links, strengthen existing networks and announce ambitious future plans for action. Despite the French government’s opportunistic protest ban, people have come together with courage, creativity and determination to make their dissent known. Despite house arrests and police crackdowns, thousands took to the streets without permission at the start of the talks. Six hundred advertisements across Paris were replaced with works of revolutionary climate art. An unofficial critical tour of the ‘Solutions 21’ corporate greenwash fair was met by an over-the-top police response; our film of the event has now been viewed more than 7 million times. A new global movement for ‘fossil free culture’ was launched with a rebel performance at the Louvre that saw ten arrests and a daring illicit video message from inside a police cell. Hundreds took part in the Climate Games, launching creative stunts from vegetable invasions to toilet-roll hijacks. Frontline communities have played a leading role in these activities. La Via Campesina targeted Danone’s headquarters in a challenge to agribusiness’ false climate solutions. 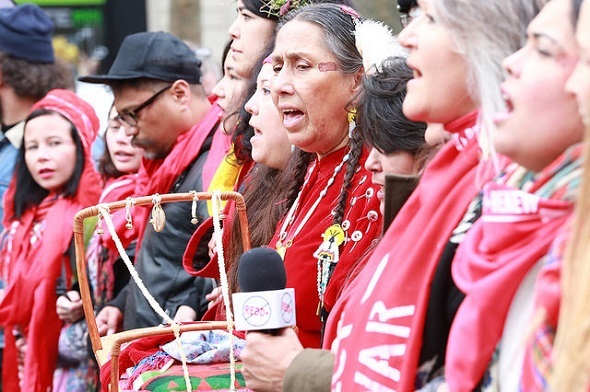 Indigenous representatives from the incredible It Takes Roots grassroots delegation opened the Paris demonstrations with a powerful healing ritual. Alongside other Indigenous and frontline representatives they held a series of events and actions throughout the fortnight, including a flotilla of kayaks challenging fossil fuel extraction and an outspoken protest at the headquarters of oil company Total. By December 12th, the ‘state of emergency’ protest restrictions had been largely shown up as unenforceable and - with huge numbers expected - the French government had little choice but to give permission for the #redlines action by the Arc de Triomphe. Thousands of people chose to push things further, with an unauthorised march to the Eiffel Tower and a sit-in on the Pont des Arts bridge. None of this would have seemed possible a fortnight ago – the tens of thousands gathered in Paris had effectively overturned the protest ban and taken back the streets. Yesterday’s red lines represented the basic criteria for survival that the Paris deal has failed to meet. The protest was a clear statement of intent: if governments won’t defend these lines, then we, the people, will. Unlike Copenhagen – which ended with a freezing, frustrated gathering hemmed in by riot police – people will be flooding home from Paris with renewed determination, connections, and inspiration, ready to bring the fight back to where they live. Most important of all are the steps that have been taken to build solidarity between Northern campaigners and Southern, Indigenous and frontline activists. To take just one example: an extraordinary gathering called ‘Frontline Fightback’ brought together over 100 people from 30 different countries, from South Africa to El Salvador to Palestine, to share strategies of resistance and build common ground. There is still a long way to go – and some Northern organizers are still getting things disastrously wrong – but the understanding is growing that the true leaders of the climate movement are the people fighting fossil fuel extraction and false climate solutions in their own communities and on their own lands. In the words of Kandi Mossett in yesterday’s Indigenous bloc, ‘we are the frontline, we are the red lines’. Indigenous bloc at 'red lines' actions, Paris, France, 12 December 2015. It is in these global alliances, in building a true movement of movements, that real hope now lies. So when we see well-intentioned Northern campaigners hailing the Paris deal as a success, or a ‘good first step’ we feel serious concern. If we promote this narrative, then we are shutting out the voices of those whose rights and lives have been trampled by the text of the agreement. To say that this is a bad deal is not giving in to despair. It is opening the door to a different kind of hope. The Paris deal lays down a marker – it tells us how far our governments have come, and how much further things now need to be pushed. Yes, we can use elements of the Paris deal as tools in the struggle, but most of us know that even a perfect deal on paper would not deliver the real changes we need without serious pressure from below. We need to take our dreams away from politicians and invest them in ourselves. Through our own actions, we can make fossil fuels politically, economically, physically impossible to extract. We can delegitimize destructive industries through divestment and sponsorship campaigns, and strip them of their power. We can take control of the real clean energy solutions ourselves and force governments to act on their responsibilities. We can defend the forests and small farms that will cool the planet, by fighting for the rights of Indigenous peoples, peasants and local communities. We can challenge the neo-colonial narratives that sacrifice the lives of people of colour around the world to enrich wealthy white elites. These struggles are already underway, and people around the world are winning important victories, from North American pipelines to Indian coal plants to the rights of forest peoples. Meanwhile, elements of the economic and financial context we are acting in have shifted dramatically since Copenhagen. The slump in oil prices has dealt a potentially catastrophic blow to the oil industry. Suddenly, the most expensive and polluting sources of oil are no longer economically viable. We are seeing fracking companies go under, tar sands pipelines and projects cancelled, and most famously, Shell pull out of Arctic drilling. The low price of coal is having a similarly devastating impact on the coal industry. Meanwhile, the boom in renewables has meant that they are starting to be able to compete with fossil fuels on price in some parts of the world. Even Mark Carney, the governor of the Bank of England, has warned investors that they face ‘potentially huge’ losses from investing in vast reserves of oil, coal and gas that are becoming ‘literally unburnable’. 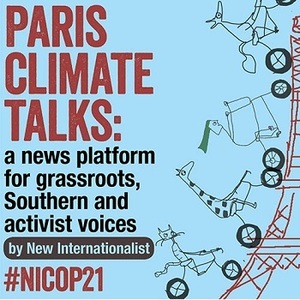 If the climate justice movement can seize these opportunities in 2016, victories could snowball, leading to a significant change in the political context in which future climate negotiations take place. Imagine a COP where industrialized countries are no longer beholden to fossil fuel giants, and democratically-controlled renewable energy is the main game in town. Imagine a COP where the voices of frontline and affected people hold more sway than the demands of the corporations. Then, and only then, might we get a climate deal worthy of the name. We the movement – not governments – have taken a step in that direction in Paris. See you in 2016.